Sun, Sep 9, 2018, 11:54 am SL Time, ColomboPage News Desk, Sri Lanka. 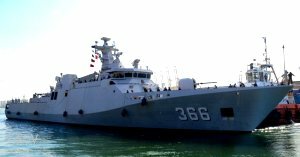 Sept 09, Colombo: Sri Lanka Navy, in accordance with naval traditions, welcomed the Indonesian Naval Ship 'Kri Sultan Hasanuddin' arrived at the Port of Colombo on Saturday on a goodwill visit. A group of officials from the Embassy of Indonesia in Colombo was also present to welcome the ship. The Commanding Officer of the Indonesian Naval ship, Commander Cecep Hidayat together with accompanying officials called on the Commander Western Naval Area, Rear Admiral Nishantha Ulugetenne and held a cordial discussion. Mementoes were also exchanged to mark this occasion. The ship's crew which includes 120 members is scheduled to take part in several friendly sporting events and other programs organized by the Sri Lanka Navy, during their 3 day official visit in Sri Lanka. The ship 'Kri Sultan Hasanuddin' is due to set sail for its next port of call from the Colombo harbor on Monday (10th).